Follow the directions on the frozen OREO churro box to warm up your churros. While the churros are heating, mix together the milk and ice cream, in a blender. When the churros are heated, roll them in the OREO sugar crumb icing (in your frozen OREO churro box), add two OREO filled churros into the blender and blend into milkshake mixture. Add the remaining OREO filled churros to each glass (one OREO filled churro per glass) and then fill the glass with milkshake mixture. Optional – top with whipped cream. This entry was posted in Uncategorized on April 15, 2016 by ChurroFan. 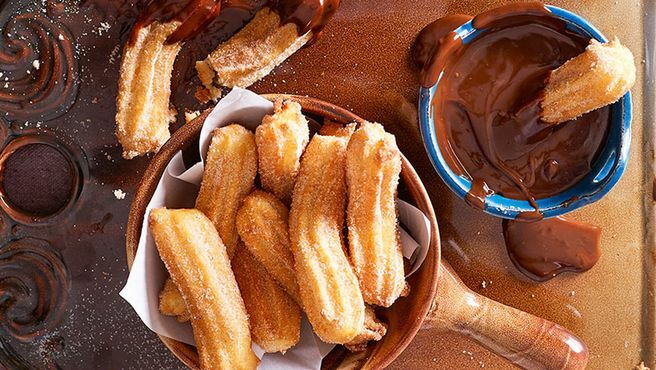 There is more to churros than just dipping in chocolate. Serve Churro Fantastico Churros with your favourite coating, topping and or dipping sauce and create a delicious canapé, starter, bar snack or share plate in minutes. 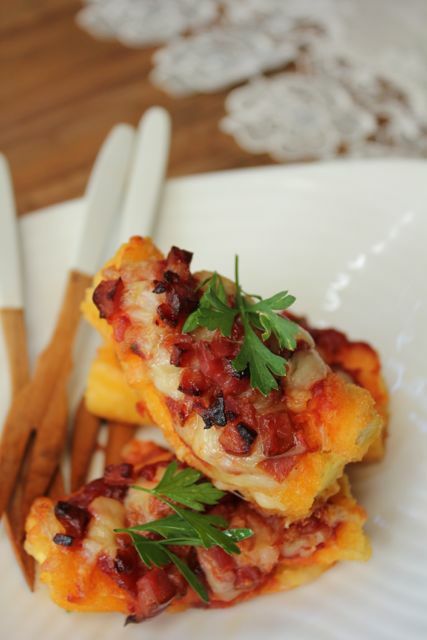 Try this great recipe idea. Quick to put together, looks fantastic and easy for any staff member to prepare. The Churro Fantastico El Chico Churro makes a fabulous addition to your menu, is extremely cost effective and can be served in a number of different ways. Preheat the oven to 200C. Place the frozen Churro Fantastico Churro Fantastico LA Churro Bites onto a baking tray lined with baking paper and top each one with pizza sauce, the grated mozzarella and then the chopped chorizo. Bake for 9 minutes until the cheese is melted. Serve hot garnished with rocket or garnish of your choice. This entry was posted in Uncategorized on May 22, 2015 by ChurroFan. Remove the Churro Fantastico LA Churros from the freezer and allow to thaw. Preheat oven to 180 degrees celsius. Arrange churros on an oven tray and place in oven. Cook on 180 degrees celsius until golden brown (approximately 8 minutes). Cut into small bite sized pieces (3cm maximum). Fill the bottom of a tupperware container with cinnamon sugar to taste. Place churro bites on top of cinnamon sugar, close lid of the tupperware container and SHAKE until churro bites are evenly coated in cinnamon sugar. Line large, cylindrical glasses with baking paper (the aim is to make them look like old fashioned fish and chip cones!). 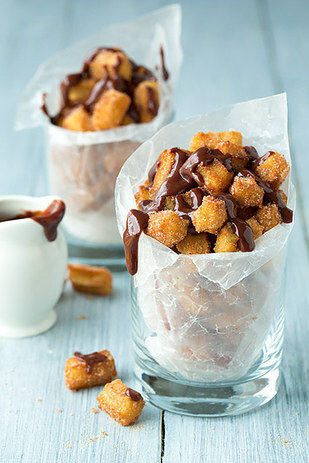 Fill glasses with churro bites. Heat our thick chocolate sludge sauce in microwave until runny. Pour liberally over the top of the churro filled glass. Remove the Churro Fantastico LA Churros from the freezer and allow to thaw. Preheat oven at 200 degrees for 10 minutes. Arrange churros on an oven tray and place in oven. Cook on 200 degrees until golden brown (approximately 8 minutes). Heat thick chocolate sludge sauce in microwave until runny. 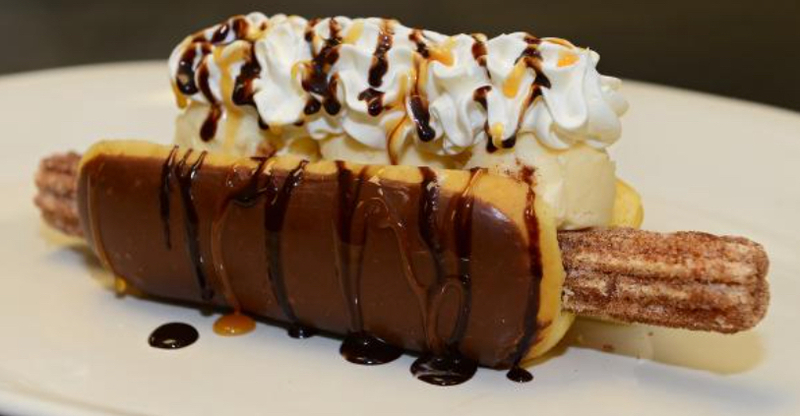 While churros are cooking, slice hot dog rolls in half and butter top of each bread roll with thick chocolate sludge sauce. When churros are golden brown, remove from oven and roll in cinnamon sugar. Place inside hot dog rolls. Add scoops of ice cream and whipped cream to serve. This entry was posted in Uncategorized on March 9, 2015 by ChurroFan. Mix the caster sugar and ground cinnamon together in a shallow pan or tray, with enough room for your Churros. Deep fry, oven bake, or grill your Churros until they are crispy and golden brown. Roll in cinnamon sugar mix and set aside. Place chocolate in a large heatproof bowl. Combine cream and coffee in a medium saucepan. Stir over a high heat until mixture is hot. Pour over chocolate. Stir until smooth, then serve while warm. This entry was posted in Uncategorized on December 3, 2014 by ChurroFan. 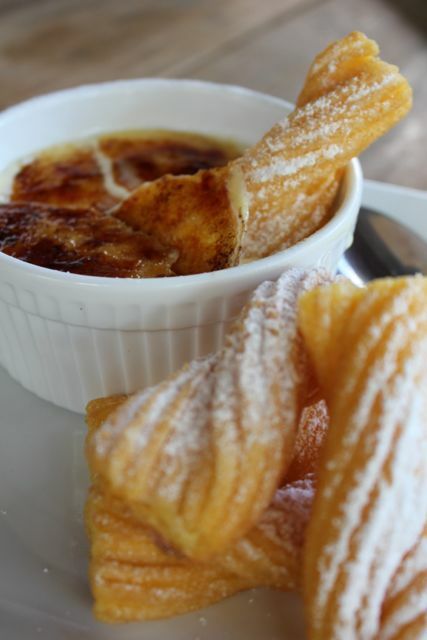 SPANISH CREME POTS WITH BAKED CHURROS! Serve our Churro Fantastico LA Churro Bites with your favourite flavoured crème brulee or try this Catalan crème recipe, quick, tasty, and a perfect accompaniment to any dessert. Our Churro Fantastico LA Churro Bites make a fabulous addition to your dessert menu and can be served in a number of different ways. Combine cream, milk, lemon, cinnamon and vanilla bean and seeds in a large heavy-based saucepan over medium heat and bring just to the boil. Cool and strain through a fine sieve, discarding solids. Beat the egg yolks and sugar until thick and pale, ten gradually whisk in cooled cream mixture until combined. Return mixture to a clean heavy-based saucepan and cook, stirring continuously, for 30 minutes over medium heat or until mixture is thick and coats the back of a wooden spoon. Cool slightly, then strain into a jug. Pour custard into ¾ cup-capacity shallow ramekins and refrigerate for 3 hours or until set. To serve, scatter tops of ramekins evenly with sugar and caramelise sugar using a blow torch or by placing under a very hot grill. Serve with Churro Fantastico LA Churro Bites dusted with icing sugar. Preheat an oven to 200c, remove Churros from Freezer and bake on a tray for about 8-10 minutes until golden. This entry was posted in Uncategorized on October 31, 2014 by ChurroFan.